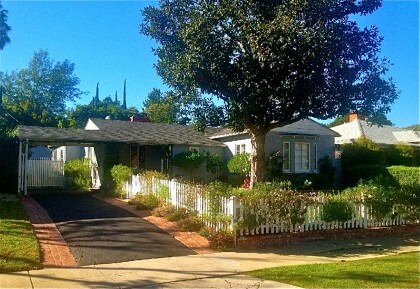 Traditional "white picket fence" home in prime Studio City location. Walk to Tujunga Village, Aroma, Vitello's, etc. Turnkey & ready to move in. Living room & Master bedroom w/ frplc. Vaulted ceilings. Crown & base moldings throughout. Formal Dining w/wainscotting. Kitchen boasts pine cabinetry & newer appliances. French doors lead to large bricked patio, with Built in BBQ, grassy yard, fruit trees, Finished garage. HVAC unit replaced 3 yrs ago & ducting 1 1/2 yrs old.